Margaret and Ferris Romaire had a "simple" wedding way back on Nov. 24, 1946, in Morgan City, Louisiana. Unfortunately, the high school sweethearts have no photos from their wedding day. 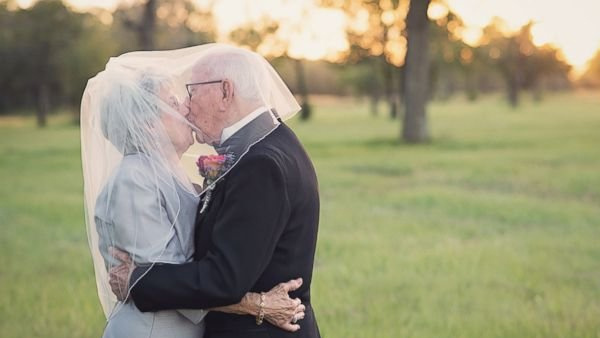 "I'm sure people had cameras then but evidently nobody thought to bring a camera to our wedding," Margaret Romaire, 89, told ABC News. "We didn't have weddings then like people do today." The Romaires went on to have four children, eight grandchildren and eight great-grandchildren. On Thanksgiving Day they celebrated their 70th anniversary, and to mark the occasion their granddaughters, Amanda Kleckley, 34, arranged a professional photo shoot to memorialize the milestone. "We take for granted how we document every moment of our lives," Kleckley said. "I wanted them to have something they could look at and be reminded of how special their marriage is." Margaret Romaire bought a $9 long dress at a local resale shop and Ferris Romaire, 90, wore a tuxedo from his closet that still fit. In late October the couple posed for photos taken by professional photographer Lara Carter in Texas. "The photographer was just so pleasant and made us feel at ease but we felt foolish, being 89 and 90 and playing dress-up like this," Romaire said with a laugh.